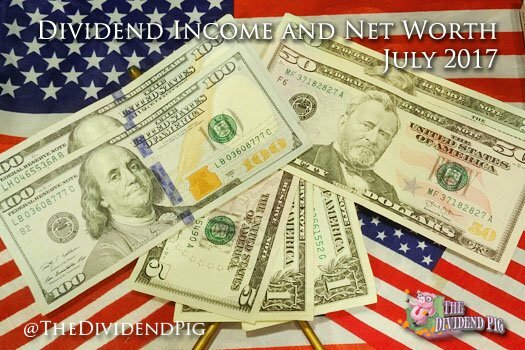 July’s dividend income has exploded again with the income being generated from my 401k. Since I’ve been able to invest my 401k myself, I have added almost $3,300 in yearly forward dividend income! Not a bad few months for this dividend investor. Net worth on the other hand took it on the chin as Zillow reassessed my property values. July has been a heck of a month in terms of dividend income. This is an exciting total to report on an “off month”. This month I received $277.07 in dividend income. On average, I was paid $23.09 from a whopping 12 companies (or 11 companies and 1 fund). This sets a personal record for largest average check per company (though, it’s obvious Disney bumped the average up). We once again have a huge monthly dividend income increase. This month’s dividend income is a 132.19% increase over July 2016. This is the kind of big increase I’ll need to reach my goals. July dividend income covers my: cell phone and electricity bill (its hot here). Its not a lot, but it all adds up! Here is a chart of my dividend income progress over the last 2 years. 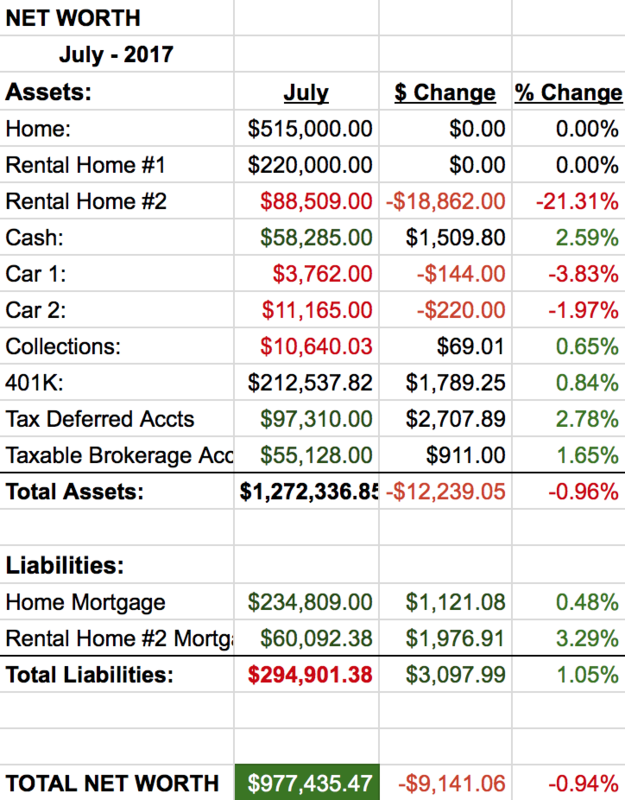 As I mentioned above, net worth lagged a bit this month with rental property #2 value falling. Cash increased slightly in July as I had planned to transfer more money over to my trading account, but never got around to it. We do have one final large home expense that will eat up a good portion of the cash reserve next month. Other than that, our savings efforts have been very fruitful. Rental property #2 suffered a huge price correction this month (according to Zillow). However, I don’t know if there is any validity to the huge hair cut as there have been no units listed for sale and none recently sold. Also, we have decided to put rental property #1 on the market for sale. It seems like now is a good time to off load the unit as the renter just left at the end of the month. We’ll have to do some painting and sheetrock work to get it ready for sale. Also, there are some of the appliances that have now magically broken, so those will need to be replaced. I’m not yet certain how much work we really want to do to fix up the place. A unit just recently sold for almost 250k in the building. It was decked out pretty well and had a fancy kitchen, which we don’t have. I’ll check how much it would cost for new cabinets, fancy countertops and appliances, but I can’t imagine that we would recoup that investment. We plan to list it for slightly under 240k and hope to get somewhere close. July dividend income was great and I’m about to have a heap load of cash to either invest or pay off my primary home mortgage. That will be a big decision as I know I need to invest hard now and build up my dividend portfolio, however, I also know there are very few screaming values to be had in the market now. I can guarantee a savings of roughly 3.5% by paying off my mortgage now, but I could also invest that money and easily average 3% in some good dividend growth stocks that will pay me, hopefully, forever! What would you do with a windfall of money, invest it or payoff your mortgage and free yourself from debt? Keep killing it there, seriously. Don’t pay attention to Zillow and keep compiling assets that produce cash flow… FOR YOU! Pumped to continue to see your progress, it’s inspiring. Thanks Lanny! I appreciate the words of encouragement! I’ll keep grinding away. Awesome job adding more stock to the dividend machine. You’ve been quite busy. Congrats. I have indeed been busy. A bit over 100k invested so far this year… it’s crazy. Still have a long way to go though. As always, thank you for dropping in! Nice job Pig! Keep growing those dividends from those solid paying companies. Keep up that impressive year over year griwth. Thanks DH! I’ll keep trying… I Made a few moves this month so far that should be nice additions!